Wear, Knitted Men’s Wear, Knitted Children’s Wear such as Polo Shirts, T-shirts, Sweat Shirts, Pajama Sets, Skirts, Night Dress etc. It has always sensed the pulse of the buyers. In view of demands for decorative T-shirt and to be responsive to fashion trends T-Design has ventured into the supporting industry with a garments printing project, embroidery project to strengthen its core business. Professional management system and well delegated power structure enables swift decision making at all levels. Our clients appreciate the beautiful fabrics, which are as soft as summer breeze, figure enhancing and durable at the same time. We have huge range of yarn such as Carded, Combed, 100% Polyester, Viscose, Z-Twist, Slub Yarn, etc. Considering this high level of expectation from our valuable clients Our fabrics are carefully knitted, checked, dyed finished and compacted to control shrinkage within the range of Max -3% to 5%. Reactive Dying, AZO Free and ensure Colorfastness. We are adapting in offering an exquisite range of garments which have received its share of appreciation and adulation throughout the world. Besides we are coming out with contemporary designs, for a striking look, that are contemporary yet classic. Men’s Wear:‐ The company offers an enticing range of Menswear that are designed using high quality fabric with utmost perfection. Long/Short Sleeve T-Shirts, Sweat Shirts, Hooded Jackets, Tank Tops, Fancy Look T-Shirts, Polo Shirts, Trousers, etc. Children’s wear:‐ The exquisite range of children’s wear are designed with extreme care and perfection to suit their tender skin. Shirts, T-Shirts, Baby Dresses, Baby Suits, Skirts, Tops and Pants, Pajama Sets, Shots, etc. OUR BOND WITH OUR CLIENTS…. We are working with different buyers around the world. Our quality products have clinched us a set of satisfied high profile clients with whom we have a developed a strong bond. We have clients in countries like U.S.A, Germany, Spain, Poland, Belgium, Netherland, Denmark, Rumania, Greece, France, Italy, United Kingdom, etc. 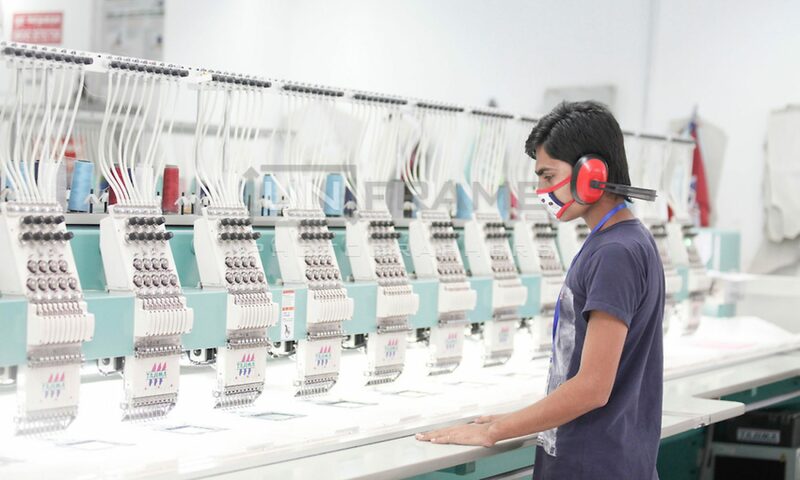 As you know well, only a complete production system can give you the maximum output, in order to provide you with the excellent facilities, our company and those, which are affiliated with it, are ready to provide backup services to produce readymade garments for a 100% export oriented market. Consequently we have computerized embroidery facilities, computerized screen‐printing unit, as well as professional manpower guided through our central management. Quality is ultimately a question of customer satisfaction. Good Quality increases the value of a product or service, establishes brand name, and builds up good reputation for the garment exporter, which in run results into consumer satisfaction, high sales and foreign exchange for the country. The perceived quality of a garment is the result of a number of aspects, which together help to achieve the desired level of satisfaction for the customer. Therefore we have 3 step procedures to ensure our quality. @ Daily 10,000 pieces of output in 2‐6 colors results low production cost and on time delivery, always. our offers also include pigment, plastisol‐rubber and discharge printing. Quality and design developed and maintained by us have been well accepted in the European market. *Setting the Industry as an international Standard. We have a compliance policy. Our compliance Policy is based on SA-8000, Local labor laws/and code of Conducts of Key buyers. The factory is full compliance with ILO and Bangladesh labor law. *Company will employ company doctor for workers’ health care & also ensure Baby-Care facilities. * The company will conduct fire drill at least 4 times a year. * The company respects the right to form and join trade unions and bargain collectively. * No discrimination based on race, caste, origin, religion, disability, gender, sexual orientation, union or political affiliation, or age will be allowed in our company. * Workers will work for 48 hours per week with at least one day off for every seven-day period. Voluntary overtime will be 12 hours per week. * The company will ensure minimum wages as stated in the minimum wage legislation of Bangladesh. The company will pay within 7th day of the month. * The factory is a smoking free zone. The factory as well as the company will always remain child labor free. The company will store age certificate, Bio-data and employment contract of all workers. * The company will not use any prison, indentured or forced labor. T-Design Ltd established in 2006, aspires for complete customer satisfaction owing to the high quality Garments at competitive prices with an on schedule delivery. It firmly believes that the satisfaction of the valued customers is the central point of its business. In short time, our brand has become a name to consider within the manufacturers of Knitted Garments, Knitted Ladies Wear, Knitted Men’s Wear, Knitted Children's Wear such as Polo Shirts, T-shirts, Sweat Shirts, Pajama Sets, Skirts, Night Dress etc. It has always sensed the pulse of the buyers. In view of demands for decorative T-shirt and to be responsive to fashion trends T-Design has ventured into the supporting industry with a garments printing project, embroidery project to strengthen its core business.